This is a post inspired by the “Red Matter” Content Creation Club, from our buddies at Burning Red. This week, we were challenged to come up with a simple “list” piece, choosing the top five to ten “things” that are related to our business. This has inspired me to finally put together a “top five web apps” list, which is something I’ve been meaning to do for a while anyway. This is the whole point of Red Matter, to encourage you to make time for your blog, and I highly recommend it. So without further ado… these are the top five web apps that we’d genuinely struggle to run the business without. This is a simple GTD task manager, based in the cloud so everything synchronises nicely between devices. I use this application constantly. Everything I do, is listed in this application. If it’s not listed, it won’t get done; it’s as simple as that. If someone emails me and asks me to do something, I immediately create a “to do” item for myself (usually with a link to the Gmail URL for that email, which is very handy). I start every day by arranging my outstanding items into order of priority, reschedule those that won’t get done, and so on. It’s not a collaborative tool — you don’t assign tasks to others, or review group progress — but it’s not designed to be. This allows me, as an individual, to better manage my own time. Nirvana is based on GTD, so it comes with all the features you’d expect to see; a “Focus” list, a “Someday” list and so on. Fundamentally, though, I just find it absolutely vital to have a task list to work through. I’ve tried many, many solutions, but none has worked as well and so seamlessly as Nirvana. This is a secure, online password manager, and another tool that I find vital. All our passwords — all of them — are stored on this site. Again, the fact that it’s based in the cloud means that all our devices automatically have access to the latest data, and all team members can access or add passwords whenever necessary. Passpack only store encrypted data, using 256 bit encryption, so even if data was lost there would be very, very little risk. I’m always amazed to see agencies relying on Excel documents saved on shared drives to store passwords, or individual developers running their own password applications and accounts locally. 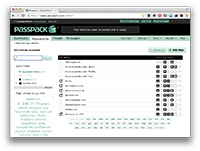 It’s essential for us to have a centralised password database, accessible remotely, and Passpack fits the bill. It’s not perfect; the website could do with a bit of an overhaul, and using it on mobile is a bit clunky. Still, this is definitely something we’d struggle to live without. A technical one, this, and one that all developers will have heard of and almost certainly used themselves. Given that we usually have more than one person working on a website build — either concurrently, or just picking up various tasks at different times — we need some way to ensure that the codebase is kept consistent, and that it’s impossible to overwrite each other’s work. This is where Bitbucket comes in, as it allows you to host as many private “code repositories” as you want. (If you have no idea what this means, there’s a nice guide to version control here). Once you get used to working this way, it’s impossible to go back. No more synchronising files over FTP, or asking someone what files they’ve been been working on. 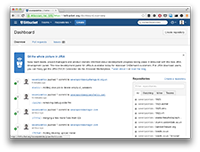 Just pull files from Bitbucket, make your changes, and push them back in. There are lots of other people offering the same service, of course, or you can host your own repositories quite easily. Bitbucket works very well though. It also allows you to maintain a small Wiki for each project, which is useful for setting out the key information about a website that everyone needs to know. 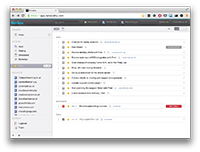 They also have a very simple “issue tracker”, which has actually replaced more advanced alternatives (such as Basecamp) for our internal task management. Even better, it’s free, although to have more than five users (as we do) you have to pay a small monthly fee. It’s still extremely affordable, though. Bitbucket actually had a few very brief network issues the other day (a rare occurrence) and we were literally struggling to get anything done. Another technical one. Code repositories, such as those hosted by Bitbucket, allow us to maintain a consistent, shared, protected codebase for all our projects. However, there’s no automatic way to transfer those files to a web server (ie, deployment); at the most basic level, one individual user still has to checkout the latest version of the code, and then FTP everything to the server. This is where Deploy comes in. Essentially, you give it the name of your Bitbucket repository, and you tell it how to connect to your server. You can then click a big button labelled “Deploy”, and it will automagically copy all the latest files from the repository directly to the server. This is such an efficient way to work, we couldn’t ever go back to using FTP. FTP is a faff. It’s slow, clunky, and actually synchronising files — working out what’s newer, what’s been changed, what can be overwritten and so on — is a nuisance. Theoretically, of course, code repositories help with this, as you can be confident that the files you’re uploading are the very latest ones. However, you’re still unsure which files to upload, so unless you upload the entire codebase each time — which would take ages — then FTP is still fiddly. Using Deploy, the process of uploading website changes to a site is quick and painless, so much so that it pretty much happens behind the scenes. (Indeed, for “client preview” sites, we usually configure deploy to automatically copy files as soon as we commit them to the repository, which removes any manual steps completely). Reverting to FTP would be a huge retrograde step. Not a technical one, this, and arguably not even a web app. However, it is another online service that has removed a huge amount of time-consuming administration and legwork from our normal working day. For us, the ability to issue invoices and file expenses directly from the website is brilliant. We no longer have to create an invoice separately, and then make sure that we’ve sent a copy of that invoice to our accountant. Because we issue invoices directly through Crunch, they’re automatically filed with the accountant, so they’re automatically added to our tax record and so on. 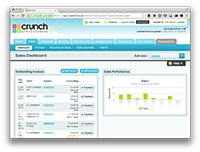 Crunch then makes it easy to see what invoices are owning, which are overdue and so on. Similarly, recording expenses in the system means that there’s no separate paperwork, no envelope of receipts to stuff and send off by post. Crunch even have an app called “Snap” that allows you to take photographs of your receipts using your phone, and file them automatically. Managing our accounts with our old accountants was painful, a slow system of updating an Excel spreadsheet like it was 1996. Crunch’s web app makes everything really easy. Note: the link to Crunch here is a referral link, which rewards us if anyone happens to subsequently sign up. However, this has no bearing on my recommendation; Crunch are excellent and I don’t know why anyone would use anyone else. If you want a standard link with no referral code, though, it’s http://www.crunch.co.uk/. As I briefly discussed in our “New Year’s Resolutions” blog post, one of our key aims for this year is to formalise and improve the level of support we offer our customers. We currently offer just one support package, which costs £400 p/m. Although this works very well for some clients (and will continue to do so), it’s has proved to be simply too expensive for others. Our full support contract is designed to offer frequent, prioritised, out-of-hours support, and most clients don’t need anything so comprehensive. Instead, they just want ongoing, occasional maintenance for their website, and the reassurance of knowing that someone is on hand to help out if necessary. We’re therefore introducing a second-tier support contract, which I’m calling “managed hosting”. This last point is perhaps the most important. Up until now, all clients have been billed at £80 p/h for website updates, with an unofficial minimum charge of two hours. However, it’s often been difficult to judge whether a very minor amend is simply too small to justify raising an invoice for £160+. In such cases, we’ve attempted to squeeze in the work for free, as a favour; but free work often slips down the priority list, or gets in the way of paid work. This doesn’t benefit us, or any of our clients. For 2014, all work will be billable. However, for clients with a managed hosting contract, anything taking roughly 30 minutes or less will be carried out for free. We can’t guarantee a fast turnaround, but we will aim to complete all such work within five working days. (T&Cs will also obviously apply; for example, we wouldn’t expect to make more than two or three such changes a month, as a rule). Where a change will take longer than 30 minutes, we will carry this work out at £60 p/h, with no minimum charge. This obviously represents a reduction on our previous hourly rate; the intention being that the new lower rate will be offset by the cost of the monthly support contract. However. In the absence of a support contract, an hourly rate will no longer be available. It will be necessary for clients without support contracts to book a full day of our time, at the standard rate of £400. I genuinely feel that this will offer a better service to our clients. This new support structure isn’t designed to increase our income; as I say, I hope that the monthly fee will be offset by the lower hourly rate. Instead, it should mean that there will be no ambiguity about our responsibilities once a site has launched, and no confusion about whether or not a particular change request is chargeable. I’ll soon be updating our rates page, and producing a more detailed explanation of exactly what a managed hosting contract will offer. This will cover the exact specification of the server, discuss the “Sitebeam” report in more detail, and generally clarify the conditions for any free work. I’ll also provide details of how a managed hosting contract differs from a full support contract, with clear examples showing how individual requests would be handled/costed under each one. If any clients reading this have any questions, please get in touch. Otherwise, watch this space! This might be a bit of a hackneyed blog post for this time of year, but – there you have it. These are more for my own reference than anything else; a list to check each month, to make sure we’re on the right track. These, then, are our New Year’s Resolutions for 2014. We’ve frequently (and especially recently) been caught out by clients wanting “ballpark costs”. These are the chicken-and-egg projects, whereby a client won’t commit until they know the likely cost – but you don’t know what they really want until they commit, so you can’t estimate costs. Our solution has always been to ask the client for a budget to work to, and then provide a spec for a website that delivers as much as possible, within this budget. Too often, though, we’ve failed to do this, and been persuaded to issue ballpark costs regardless. (This merits its own blog post, I think. Essentially, by asking for a budget up-front, clients often worry that you’ll charge them that full amount, rather than possibly quoting them a figure that’s comfortably lower. However, this is the wrong way of looking at it. We should be charging them their full budget, if that’s what’s available – our job is to get the maximum return for the client’s money. I always feel that it’s similar to “sniping” on eBay, where people incrementally bid tiny amounts on an item to get a bargain. If that item then goes to someone else for a higher figure, and you’d have been happy to pay that higher sum, then you really should have just bid the maximum amount you were happy to pay in the first place. Establish how much you can afford to spend, and then get the best possible product for your money). Anyway, I digress. A ballpark cost very quickly becomes a fixed cost, within which the client feels they can demand pretty much anything they want. No more ballpark costs — I firmly believe that if a client can’t give you at least a rough budget before you start, they aren’t really serious about the project. A quick test for a client who claims not to have a figure in mind, is to quote ~£50k. When that comes back as “far higher than we expected”, simply ask them what they expected. That figure is their budget. There are caveats, as always. If a ballpark figure is genuinely essential (for example, if a sales department is trying to sell in a new tool to their management team, and honestly don’t know what funding will be made available), then I’ll always (a) quote high, and (b) set aside some concrete time to review the initial spec before eventually starting work. If the spec exceeds the ballpark, then the ballpark must be revised. We’ve always, since starting the company, struggled to find the best way to support existing clients and projects. As our client base has grown, the general level of support requests — bug reports, or small “can you just…” changes — has grown hugely. We can literally lose days to handling these requests, often without ever raising an invoice. One solution we put in place was to increase our hourly rate to a fairly high level; this made it viable to carry out — and invoice for — an hour or two of work here or there. However, this still leaves a lot of very small jobs (say, half an hour or so) un-billable, as I try to weigh up “keeping the client happy” with “charging them £200 for a fairly small job”. What I’ve realised, though, is that by keeping these clients happy, we start to let down other, paying clients, because the small pieces of work distract us from the larger, important projects. For 2014, all work will be billable. I have a grand plan as to how we can implement this, in a fair and constructive way. My next blog post will go into much more detail. Watch this space. OK, 99% of the time my emails are professional, calm and helpful (I hope). However, on some projects — especially those that started with a ballpark cost! — it’s easy for frustrations to boil over. I do occasionally find myself writing long, slightly tetchy emails that go into far too much detail. Emails which spend far too much time explaining why I think a request is unreasonable, or what underlying external issues I feel have caused a specific delay or problem. This is almost always unnecessary, and has no benefit. This year, all emails will be replied to with a straight bat; polite, friendly, and to the point. Also regarding email, I really need to stick to my own policy of checking emails at set times. This works extremely well; I don’t enforce it for staff, as I think it’s a personal decision, but I find it hugely increases my own productivity. However, I do find myself drifting back to my inbox when I need a break, or when I’m simply procrastinating. Not this year. Sorry, Windows users. If you’re still running Windows XP (which was released in 2001) and you refuse to use Chrome or Firefox or Safari rather than IE8 (released in 2009), then we can’t help you. The websites we build might work. Should work. Almost certainly will work. But they won’t look great, and there are no guarantees either way. This is more of a technical goal than a resolution. This is the year that we’ll leave our current PHP framework of choice (Codeigniter, now discontinued) and switch to something more current. At the moment, the best option would appear to be Laravel, although this may yet change. What we will be doing is assessing a few frameworks, making a decision and then transitioning to it. This will be a fairly major shift, but a necessary one. OK, hands up. When it comes to Twitter, agencies in glass houses shouldn’t throw stones. I’m not massively happy with our Twitter feed as it stands. It’s an odd mix of industry news, technical PHP tips, and a few random non-work things that amuse or interest me. I also find it hard to strike the balance between tweeting as “the company”, and tweeting as an individual (I think this is quite a common problem for small agencies). I’m working on it. Having said that, these are the top five tweets from marketing agencies that always make me think, “Oh, come on — you really should get Twitter by now”. A schoolboy error: you have confused Twitter with “text messaging”, or perhaps, “greeting your co-workers”. What is the point of this tweet? Are you actually interested? Really? Are you expecting a hundred different replies? Mine was fine, thanks, quite busy running around after the kids but all good fun. You? Will you then reply with a summary of your own weekend? Nobody gains anything from this exchange. Nobody follows you in order to be asked how their weekend was, unless they’re extremely lonely. Invariably, no-one replies to these tweets. I always want to respond after a few hours with a photo of some tumbleweeds, but never dare. Last I checked, Google was the world’s most popular search engine by a huge margin, with about eight trillion searches a second. It’s probably the first page that 90% of your followers have looked at when getting online that morning. They have already seen the Google Doodle. Plus, Google have doodles all the time now, it’s not even news. You may as well tweet, “The sun is in the sky”. Yes, we know. We’re looking at it right now. Cheers. 3. A popular meme, posted about five days too late. “Check out this baby being snatched by an eagle! !” Yeah, we checked that out on Monday, when every other man and his dog tweeted the same link. Then we found out on Wednesday that it was faked. It’s Friday now. This is the Internet. Today’s news is pretty much today’s fish-and-chip wrapper. You may as well retweet your equally pointless “How was everyone’s weekend?” tweet for all the relevance this has. This is maybe a bit of a harsh one — after all, what is Twitter for if not self-promotion? — but to me, this always just sounds a little too smug. If you’re working with some nice clients, or have started an interesting project, tell us what it is. Even if you can’t name names, you can add some substance. Whooping about your latest wins tells us nothing; for all we know, you’re making it up and you haven’t won anything for months. Tweeting “Yay for us!” is the Twitter equivalent of the Facebook status “Rubbish day today :-(“. It’s designed purely to elicit a response (“U OK hun?”), to which you can tap your nose and appear mysterious, secretly hoping people will ask more. We won’t. This one is baffling. “Make sure you tune in for our latest dog food commercial, 7:15 tonight during Cowboy Builders on Five“. Seriously? Newsflash, no-one enjoys watching TV adverts. I’m not sure people even enjoy watching TV much nowadays. One of the many benefits of downloading TV shows is that you’re not interrupted every 15 minutes by idiotic adverts for toothpaste. (Hey Sensodyne; if you’re going to pretend that you’re interviewing a dentist live, and wiggle the camera around as if it’s a handycam, that’s fine. Rapidly cutting through multiple camera angles is pushing it a little, though). Either way, no-one — absolutely no-one — is going to purposely tune into a TV show halfway through, to watch an advert you have produced. OK, you will. Your colleagues will. And so you should, you’ve produced some work that you’re proud of. Really, though, this is an internal memo. Not a tweet. NB: This is really an update for clients, rather than a blog article. However, it may raise some interesting questions, so I’ve posted it here regardless. Over the last few months, we’ve found the number of emails we receive to be very distracting. It was becoming clear that when we weren’t receiving emails — when we were working offline, or out-of-hours — our productivity increased. This was purely because we weren’t having to continually respond to messages, and we could focus on the tasks in hand. Obviously, communication is very important, and email is an excellent communication tool. Ultimately, though, it’s equally important that we don’t miss key deadlines because we’ve been sidetracked by day-to-day minutiae. So — we’ve implemented a new policy that aims to address this. There will be very few exceptions to this rule! This means that most emails should still be answered within three or four working hours. If an enquiry is especially urgent, clients should call the office; the main number will always be answered during office hours. This isn’t something that’s just designed to make our lives easier. It will, I believe, allow us to provide a better all-round service to all clients. However, if this will affect you, and you have any comments or questions, please don’t hesitate to get in touch. We also have several other changes in the pipeline, regarding scheduling, costs and our support/warranty packages. These will be explained in future blog posts! A quick addendum to this; any emails from clients with support contracts will be checked throughout the day, and not only at these fixed points.